Have you been to your local op shop lately and found the pants of your dreams? Have you driven past a donation collection point that was overflowing with unwanted trash and treasures? Have you noticed that your roommate has recently added small boxes to the kitchen cupboard to separate the herbs from the sauces? And when you visit your parents’ house, is it suddenly really well organised – and your mum has thrown out most of your childhood junk? Whether you’ve seen the new Netflix series or not, you’ve definitely seen the repercussions of Marie Kondo’s Tidying Up. 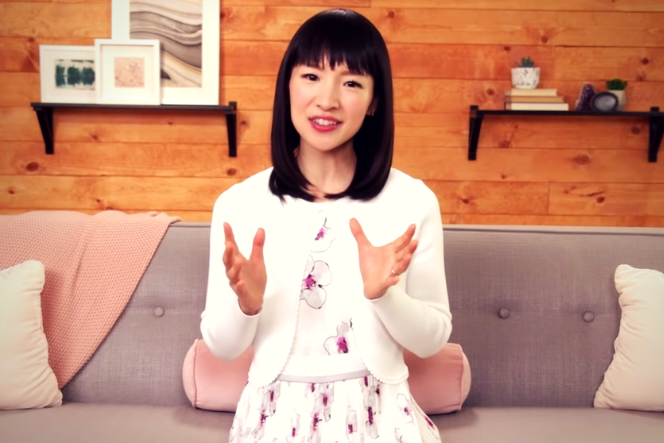 If you somehow don’t know who she is already, Marie Kondo is a Japanese organising consultant who is known for the KonMari method of organising. The KonMari method is where you gather all of your items and decide what ‘sparks joy’ for you. If it doesn’t spark joy, then you don’t need it in your life (so people donate it or they throw it out). If it does spark joy or it’s a necessity (I mean, does a potato peeler really spark joy for anyone? ), then you keep it and assign it a place in the house. Though this outlook on tidying is clearly targeted at middle-class people who can afford to make unnecessary purchases in the first place, most people can find some value from KonMari. Kondo’s book The Life-Changing Magic of Tidying Up was first released in 2014 and was met with mixed reviews. Despite people making fun of it, a lot of us loved her book. Like, really loved it. From what I can tell, the KonMari converts were mostly women anywhere from 20-years-old and up. But they loved it so much that earlier this year, Netflix released their exclusive series, Tidying Up with Marie Kondo. Picture this – hoarders. But it’s Marie Kondo going through someone’s house filled with piles of actual junk, broken plates and clothes made in the early 1900s. She picks up a matted wig in which a stray cat has made its home. She looks at the owner of the house and asks, “Does this spark joy?” The owner nods. Marie puts the wig-cat back on the floor. But then suddenly at the end of the episode, the owner listens to Marie and realises that he doesn’t need it all and there’s an amazing transformation! That’s what myself and a lot of others were expecting coming into this show. Something big. Something that changes my life a little. Needless to say, the actual show was a little underwhelming. I’m not saying it was bad per se, it was just okay. If you haven’t seen the show, all you need to know is it’s basically just Marie going through people’s houses and them realising they own too many things. Then she tells them how to organise things and how to fold clothes. She leaves, comes back and they’ve done it. The people say it changed their lives. The end. Marie is really sweet, and all of the people are really sweet – it’s a really sweet show. It’s kind of boring actually, but the show itself is mostly unproblematic. Though Marie’s books are all fairly well received, they were targeted at a specific demographic: middle-aged people who know their lives are a bit messy and they want to clean it up. But almost everyone has Netflix, and almost everyone is interested in a new Netflix exclusive. After all, it’s a new year, new you. You’ve been wanting to tidy up for a while now anyway. 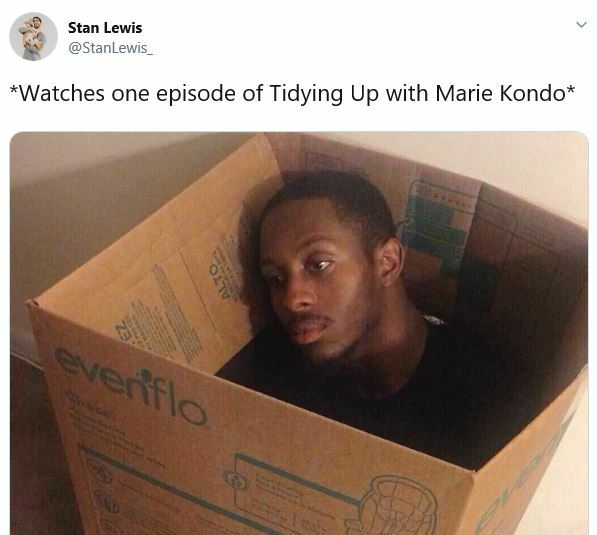 So now, everyone with a Netflix account has KonMari fever. People are throwing things out like crazy and it’s not just limited to a couple of boxes of clothes. If you’ve been to a Salvo’s, Vinnie’s or any op-shop recently, then you’ve probably seen the piles of boxes and bags that people have donated. You may have also seen random clothes just thrown on the ground near the donation points, or even a stray piece of clothing that is flying down the street in the wind. I’m sure if you opened up some of the bags of donated goods, you wouldn’t just see old clothes. You’d see clothes that haven’t been washed, clothes with mysterious stains, used pads and tampons, broken glass, used tissues, random bits of rubbish, and just pieces of junk that people didn’t want to dispose of properly. This is happening all across Australia, with a lot of op-shops refusing donations for the meantime due to both the disgusting things they find and the overwhelming amount of clothes they have to sort through. If you put that aside for the moment, then for some people, Marie Kondo’s methods are really helping. Many people have found the motivation to go through their old items and get rid of things that are associated with bad memories. They’ve learnt to organise the things that they do keep. More Australians have discovered minimalism and have realised they don’t need so many “things” to live happily. People are cleaning out both their houses and their lives. Marie Kondo’s idea of sparking joy isn’t just limited to physical items, but to people and thoughts too. We can live in a tidy home where every item makes us happy, but we also need to live a life where we surround ourselves with people who make us happy. Many Marie Kondo viewers are beginning to come to this realisation, which really can be life-changing. That’s the Marie Kondo Effect – a tidier house, a happier lifestyle, and a heap of junk being donated. Do what you’ve gotta do to be happy, but hey, just dispose of things properly.